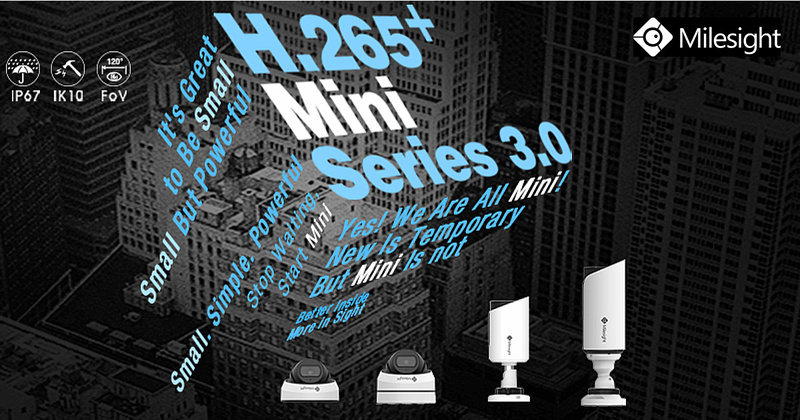 Milesight Technology Co., Ltd. unveiled the brand-new IP CCTV camera Mini Series 3.0, which is born to challenge your imagination of the MINI. The Mini Series includes H.265+ Vandal-proof Mini Bullet Network Camera, H.265+ Vandal-proof Motorized Mini Bullet Network Camera, H.265+ Weather-proof Mini Dome Network Camera and H.265+ AF Motorized Mini Dome Network Camera. The Mini Series 3.0 is truly MINI yet POWERFUL. It features 2.8mm 120° ultra wide angle lens, IP67&IK10, Smart IR II technology, H.265+ Codec, ultra low-light capability, super WDR and high definition. Equipped with so many advanced technologies and functions, the weight and size of the Mini Series are greatly smaller than the industry level. For example, the weight of H.265+ Vandal-proof Mini Bullet Network Camera is only 450g, and its size is just 64mm x 160mm. Applied with 2.8mm ultra wide angle lens, the cameras of Mini Series 3.0 could catch up to 120° field of view, which is the leading level of the industry. And the resolution up to 5MP guarantees superior image details under wide angles. The Mini Series 3.0 feature the industry-leading IP67-rated weatherproofing and IK10-rated vandal proofing, which allows the cameras to protect themselves against adverse impacts to ensure the robust performance. To maximize the IR performance, the cameras of the Mini Series 3.0 innovated both in the structure and technology. The advanced Smart IR II technology guarantees IR performance with adjustable illumination intensity. The infrared light transmittance is greatly increased with IR anti-reflection panel which is well designed for better IR effect. Source: Milesight Technology Co., Ltd. Tagged Milesight. Bookmark the permalink.